Channel 10 poll gives Jewish Home 14 seats, marking a recovery from Eli Ohana saga. Labor and Likud each have 23 seats. A new poll released Sunday evening shows that the Jewish Home is beginning to recover from the saga surrounding soccer star Eli Ohana, who joined the party and stepped down only a few days later following backlash. 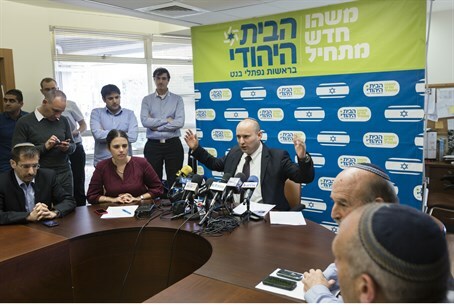 The poll, conducted by the Midgam project for Channel 10 News, found that the Likud and the “Zionist Camp” made up of Labor and Hatnua would both win 23 seats if elections were held today. Jewish Home is the third largest party in the Knesset, the poll found, with 14 seats, a number identical to the number of seats it received in a poll released shortly after the Ohana scandal, but an improvement over a poll from Saturday night which gave Jewish Home only 11 seats. The Arab parties are behind Jewish Home with 13 seats, the largest number of seats the joint list has received in any poll to date, and are followed by Yair Lapid’s Yesh Atid and Moshe Kahlon’s Kulanu, both of which have 10 seats. The poll found that Aryeh Deri’s Shas will receive six seats in the next Knesset, as would United Torah Judaism. Avigdor Liberman’s Yisrael Beytenu, Meretz and Eli Yishai’s Ha’am Itanu each have five seats. The poll also asked the public who, in their opinion, is the most suitable candidate for prime minister. 46% of respondents said that Binyamin Netanyahu is the most suitable candidate, 31% said that Labor leader Yitzhak Herzog is the most suitable and 23% said they do not know.